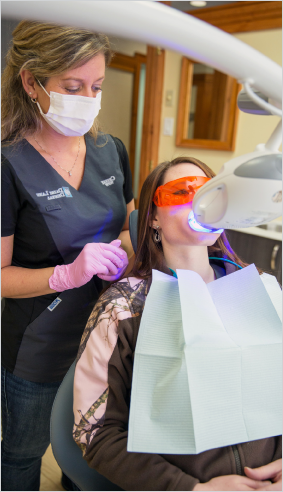 Get a white, radiant smile with Zoom! Zoom Tooth whitening is an in-office whitening treatment that provides a quick way to enhance the beauty of your smile. Your teeth can be whitened a few shades, making them noticeably whiter. The procedure is simple, non-invasive and can dramatically change the color of your natural teeth. Your teeth whitening appointment will take about an hour, during which a special gel is applied to your teeth in three short sessions. During these sessions, the special Zoom! light is focused onto your teeth, breaking up stains and discoloration. The entire process takes about an hour, after which you go home with a great smile. At the conclusion of your treatment, you will be given care instructions to help you maintain your new smile. Good oral hygiene practices and regular visits to your dentist will help you maintain a beautiful, healthy smile. With the new Philips Zoom QuickPro whitening varnish, patients can get noticeably whiter results in minimal time. QuickPro uses a breakthrough two-layer technology to whiten teeth up to four shades* – and takes just five minutes to apply. After 30 minutes, the patient simply brushes or wipes off the varnish. Contact us if you have any questions, or to schedule an appointment for teeth whitening. 23 Dairy Lane, Unit 1.